Caroline Hyland is an artist in residence at Tallaght University Hospital (TUH). 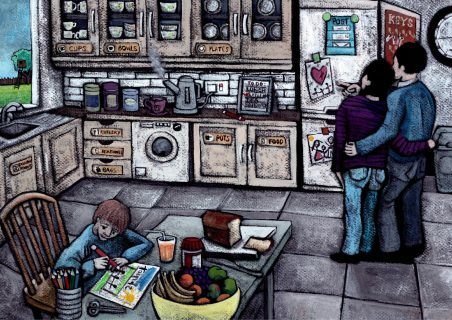 ‘Can You See What I See?’ is a series of paintings by Caroline strongly informed by listening to people with dementia and to those that support them, their families, friends and the medical professions. The seed for this project started many years ago when my dear granny had Alzheimer’s disease, as did three of her sisters. Knowing nothing about dementia both puzzled and scared me but also presented many questions, thoughts and ideas. While working as an Artist in Residence in TUH, I attended a HSE Dementia Awareness training course which validated many of my queries. At the time, I was also involved in community art, advocacy and volunteering with the LWWD project. All areas provided information and narratives developing my view of dementia and most importantly what it might mean to an individual experiencing it. Firstly, I learnt the importance of using ‘all senses’ to really listen to people who live with dementia and to those that support them. Being in the moment with someone and respecting their reality ‘validates where they are at’ (Leah Bisiani) and ‘even though you may not share the same reality you can still share the same joy’ (Jolene Brackey, Creating Moments of Joy). Wendy Mitchell, who lives with dementia, describes emotional memory and how ‘her emotional bookcase is stronger and more resistant’ than her memory bookcase. She may forget the details of particular events or encounters but what ‘stays with (her) is the feelings’. According to Dr David Sheard, Founder of Dementia Care Matters, the emphasis in dementia care needs to shift from ‘doing person centred care’ to ‘being person centred’. You may not be remembered for what you said or did but you may be remembered by how you made a person feel (Maya Angelou). Secondly, people don’t want to be defined by dementia. They want to be valued and seen as someone who can continue to contribute to their community. They want to remain engaged and live well. A lack of understanding, stigma and fear can lead to the person and their family becoming socially isolated. Dementia touches many lives and is not just a health issue but a social issue that requires a community response to stand together (Understand Together HSE Campaign). It is therefore important for all members of society to feel informed – that there are little things we can do to help. 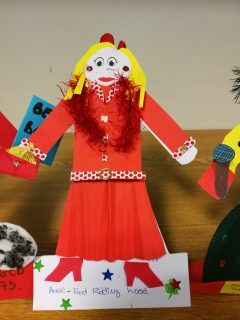 During the Dementia Awareness course I decided it was time to create a piece of art in response to what I was learning. ‘Can You See What I See?’ was the title of the painting submitted to the ‘Refresh’ staff art exhibition in TUH in 2016. 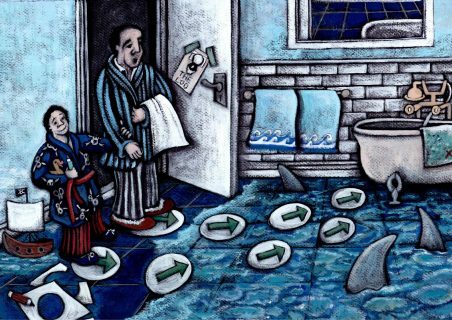 From this point on, with the support of Alison Baker Kerrigan, NCAH Arts Officer, discussions were developed to create a series of 12 illustrations and accompanying text based around the same theme. This would be developed into an informative exhibition to encourage spectator engagement with the art whilst inspiring viewers to then share their learning to help themselves and others. Following on from the first illustration, I used a dry brush technique which starts with a black sheet of textured paper. From the black background I slowly add paint, creating light areas out of the darkness – a metaphor for the aims of the work. This style is a particularly slow process, each painting taking up to 30 hours to complete. It allows time for change and space to reflect on the direction of the project. 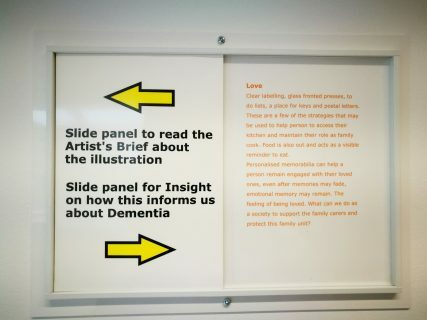 Each framed illustration is presented alongside a sliding panel containing 1) a narrative about the illustration and 2) information about dementia. The text is an invitation to stop and interact with the art. The sliding panels were designed for accessibility: I consulted with the Azure programme to ensure font style and size, lay out and the language used are suitable to all viewers. The sliding panel itself acts like a metaphor in that sliding the panel from one side to the other hides what was visible, whilst revealing what was hidden. Through listening and being in the moment with a person with dementia, is there a possibility for us to reveal a little bit of what is hidden or presumed lost, for even short moments in time? A comment box accompanies the exhibition as a further invitation to engage, start a conversation with the viewer and receive feedback. Exhibition displayed on Hospital Street in TUH from November 2017 to March 2018. 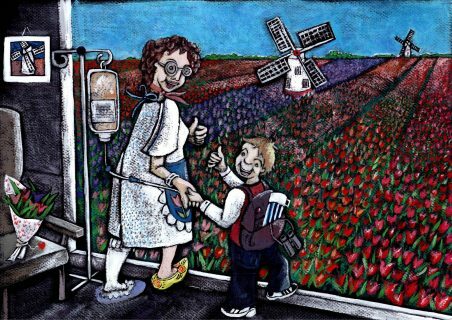 The artist created a pack for the TUH exhibition to share with in-patients at their bedside and with people in the Charles O’Toole Day Hospital who were unable to visit the exhibition. A set of prints with sliders will remain in the permanent art collection of TUH. Exhibition tour: University Hospital Waterford (September and October 2018); Rua Red Arts Centre, Tallaght, Dublin (November 2018). Dates and venues for 2019 are to be finalised. People are invited to respond to the exhibition through the comment box installed. A number of questions are asked, for example: Is visual art a good way of sharing information on dementia? Did you learn something? Would you use or share any new learning? Informal chats with staff, patients and visitors during the TUH exhibition gave rise to people telling their own story about their connection with dementia. All were invited to fill in comment cards and give verbal feedback. Organisations and individuals internal and external to TUH voiced support and showed an interest in becoming involved with the project. The Adelaide Health Foundation has granted further financial support to the development of the exhibition, including art workshops and a book to accompany the exhibition. The artist has been invited back to speak on the HSE Dementia Awareness training Course in the Centre for Learning and Development, TUH, in September 2018. As a first solo exhibition, I embraced unexpected challenges in the work that goes on behind the scenes, moving through roles of artist, writer, editor, co-curator, administrator, promoter, facilitator and communicator - a huge learning curve. The School of Nursing and Midwifery, Trinity College Dublin, is purchasing a copy of the exhibition (print collection) for the GAS building in D’Olier Street, Dublin. 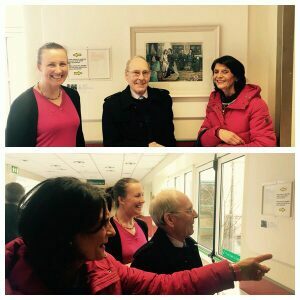 The School has also expressed an interest in exploring the educational benefits of using art to teach nursing students about dementia care. Thank you to my family and friends; Alison Baker Kerrigan (NCAH) who played an invaluable supportive role at each stage of this project; Prof. Des O’Neill and Dr. Ronan Collins at TUH, the arts team in TUH, Mary Spain and all those involved with the LWWD project, and the many people who have supported and advised me throughout this project. I would also like to thank the many people who are living well with dementia and those who support and advocate with you. I have been greatly influenced by you all. I hope this exhibition plays a role in influencing the general public to create supportive environments where a person with dementia is a valued citizen.